The item Dragon knight's axe, (ebook) represents a specific, individual, material embodiment of a distinct intellectual or artistic creation found in Charlotte Mecklenburg Library. 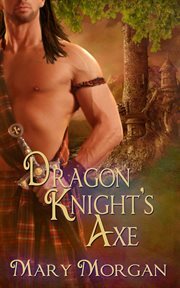 Alastair MacKay, a battle-scarred Dragon Knight flees to the sea to separate himself from his fae-given power connecting him to the land. But it is on land that he rescues a woman from a slave trader in Ireland. It is through Fiona he steps back inadvertently into a world filled with magic-taking on the role of protector and at the same time leading him on a journey to confront his greatest regret and fears. Research assistant, Fiona O'Quinlan loves translating ancient artifacts at Trinity College. When she falls asleep on an archeological dig, she awakens in another time. She soon discovers a Dragon Knight's relic has been entrusted into her care. Determined to return the artifact to the Great Glen, Fiona is unprepared for the danger ahead-losing her heart and soul to Alastair "Beast" MacKay. Will their love be strong enough to soothe the beast and heal the man? Or will Death swing its axe, leaving them lost for all eternity?